Each week we are featuring a new theme as part of our Weekly Virtual Book Club for Kids. Last week was all about Night. This week is OWL WEEK. 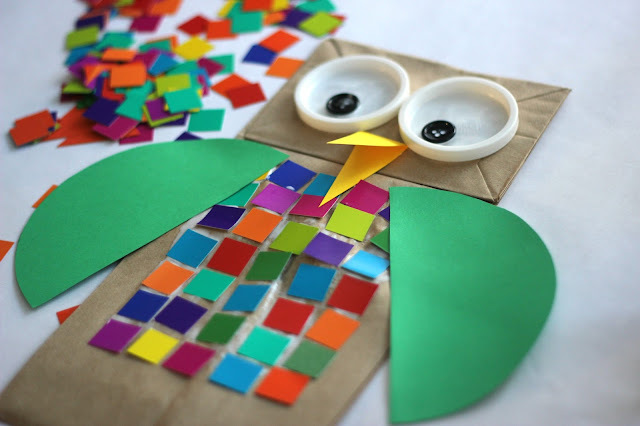 Our featured book this week is Owl Babies by Martin Waddell and we decided to do an owl themed puppet craft to go along with the book! 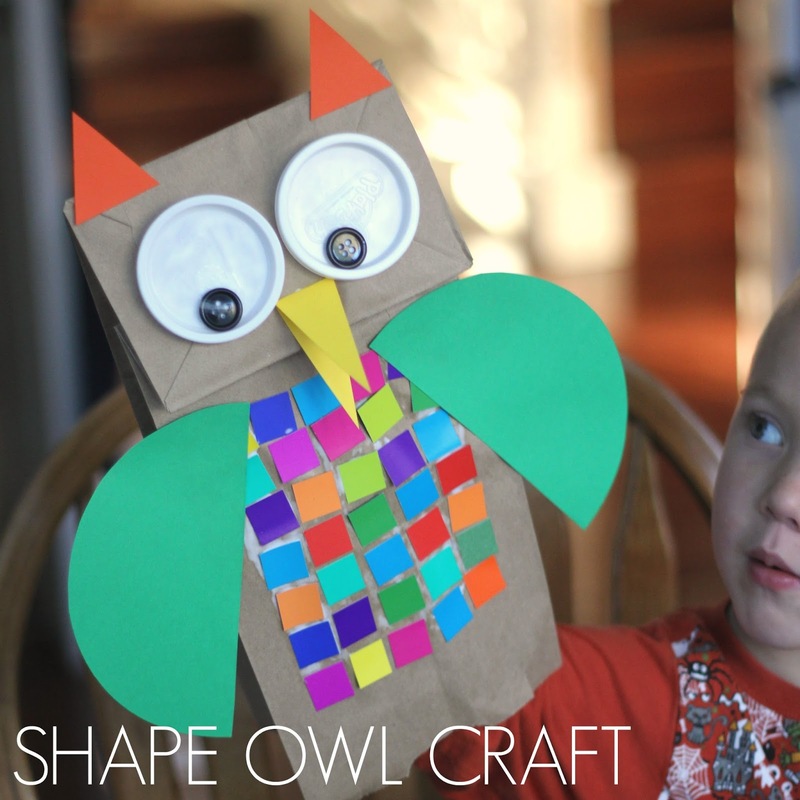 Have you ever made an owl puppet? We just grabbed a few favorite items from around the house and started creating! 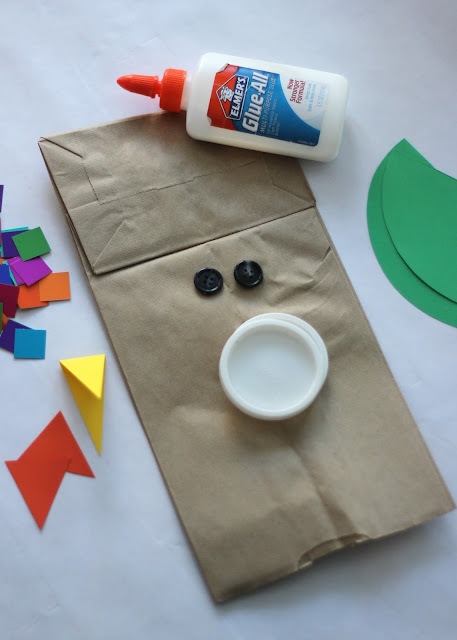 This is a simple puppet craft that can also be used while you talk with your kids about shapes! This is my example version of our puppet craft. The kid versions will not look like this, but we haven't had a moment this week to make any crafts together. 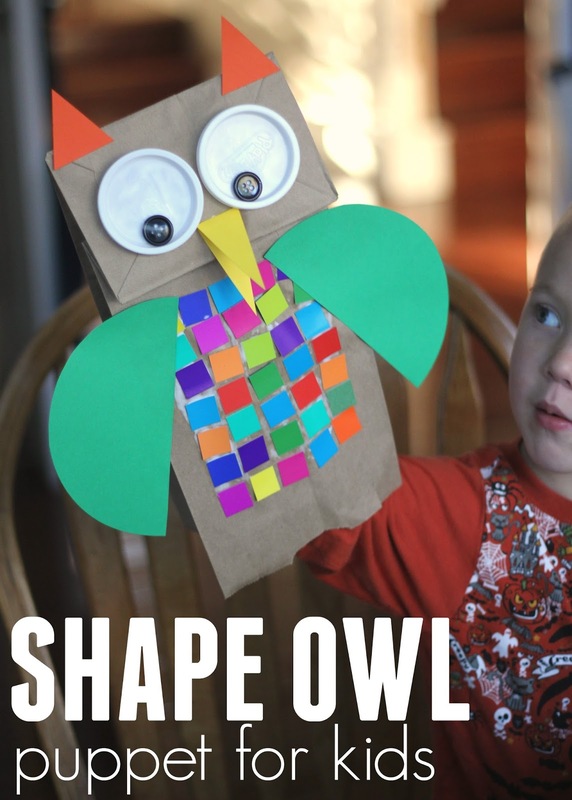 We are planning on follow this tutorial together later in the week so that each of my kids can make their own owl puppet. 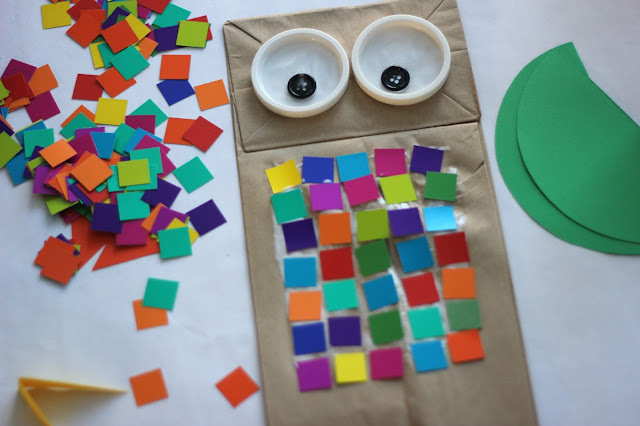 To get started with these puppets you need to add on eyes! 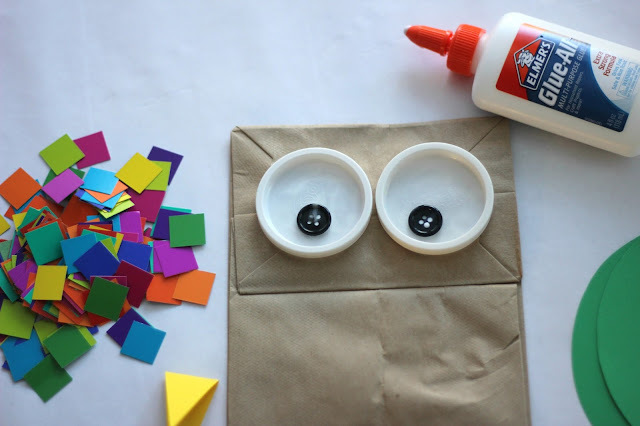 I love big owl eyes, so we used playdough lids and then buttons for eyeballs. White glue works well. Once we glued on the eyes, we added a triangle mouth. By folding two triangles in half we made a beak that pops out! We also covered the owl in glue and made colorful square feather patterns for the owl's belly. Lastly, we cut a large circle in half to create two wings that are semi-circle shaped and we added triangle ears to the top of the owl. Once our owl was dry all the kids wanted to touch him and talk to him and make him move. 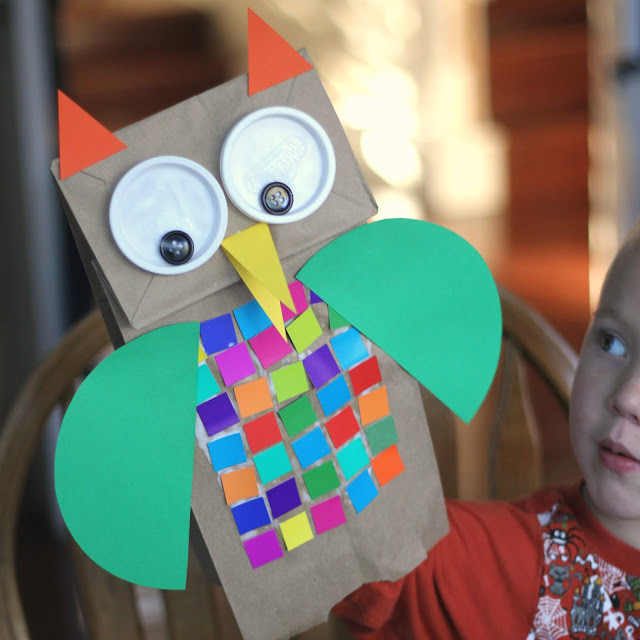 You can use your owl puppet to recreate your favorite owl story. As you are playing with your owl you could talk about the colors on the "feathers" and the shapes of the different parts of the owl- especially the wings, ears, feathers, beak, and eyes! Have you made any owl crafts yet this week? 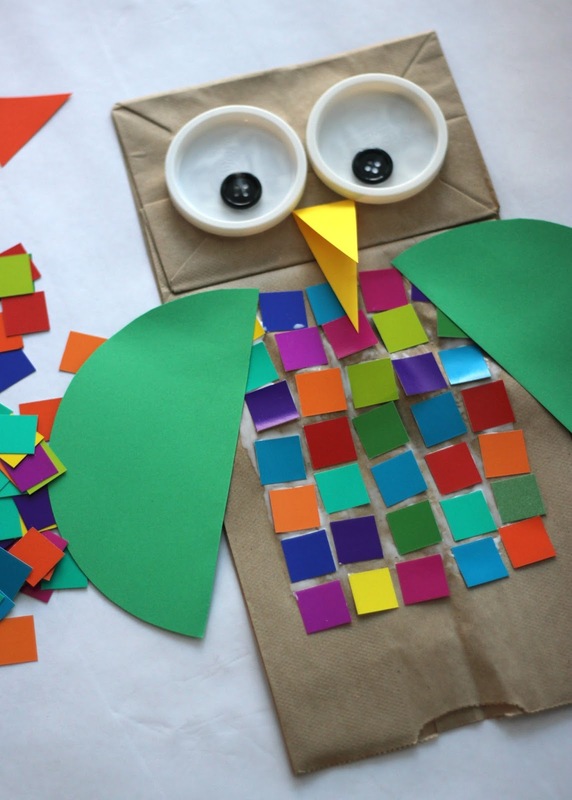 Have you done any owl themed activities? Here are the Owl Week activities shared by our Virtual Book Club o-hosts! If you try any of these this week, tell me about them in the comments! Goodness this is so cute. The eyes are just killing me. Adorable.